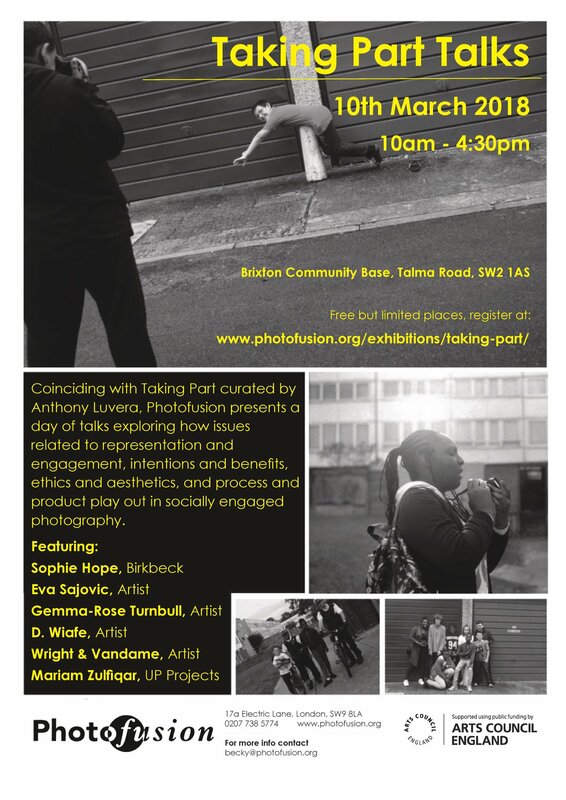 If you’re interested in how issues related to representation and engagement, intentions and benefits, process and product, and ethics and aesthetics, play out in socially engaged photography, the Taking Part Talks are happening in Brixton, London this coming Saturday the 10th of March. Speakers include Gemma-Rose Turnbull, Eva Sajovic, Wright & Vandame, D. Wiafe, Sophie Hope, and Mariam Zulfiqar. Tagged Anthony Luvera, D.Wiafe, Eva Sajovic, Gemma-Rose Turnbull, Mariam Zulfiqar, Photofusion, Sophie Hope, Taking Part, Wright & Vandame.